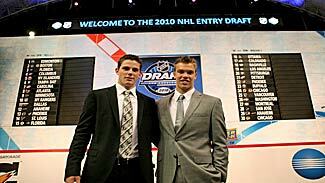 There were no surprises in the first two selections in the first round of the 2010 Entry Draft – call it the Taylor (Hall) and Tyler (Seguin) Show. But not everything went according to form after that. After the Florida Panthers picked defenseman Eric Gudbranson with the No. 3 pick, the Columbus Blue Jackets drew a lot of oohs and aahs from the crowd at the Staples Center by selecting Ryan Johansen, a center from the Portland Winterhawks of the Western Hockey League with the No. 4 selection. Johansen was ranked No. 10 among North American skaters in the final rankings by NHL Central Scouting – and while he had risen from 150 th before the season to 16 th in the midseason rankings, having a team take him at No. 4 was a surprise. Johansen, 6-foot-2 and 192 pounds at age 17, scored 25 goals and 44 assists for 69 points, had 53 penalty minutes and was plus-17 in 71 games with Portland in 2009-10. He ranked second among WHL rookies in points. He added 6 goals and 18 points along with 18 PIM in 13 playoff games to lead all WHL rookies in playoff scoring. The New York Islanders followed with another surprise by taking Johansen's Portland teammate, Nino Niederreiter, with the fifth pick. Most pre-draft speculation said the Isles would focus on taking one of the several high-rated defensemen available, and Niederreiter, rated 12th by Central Scouting in the final rankings, up from 14th at midseason, wasn't expected to go until later in the first round. Niederreiter, the highest-drafted Swiss-born player ever, led Portland with 36 goals last season. The 6-foot-2, 201-pound right wing was also one of the stars at the World Junior Championship, where he made the all-tournament team. "Our goal has constantly been to add the best player into our lineup that will help us build our young core into a team that consistently competes for the Stanley Cup," Isles General Manager Garth Snow said. "Nino was extremely impressive in the World Junior Championships playing for Team Switzerland, using his size to create space. He is a big power-forward who while add size to our lineup for years to come." The surprises continued – partly in terms of whom wasn't taken. Defensemen Cam Fowler from Windsor of the OHL, ranked No. 5 in Central Scouting's final rankings, Brandon Gormley from Moncton of the Quebec League, rated No. 6, both fell out of the top 10 – as did defenseman Mark Pysyk (No. 7), California-born forward Emerson Etem (No. 9) and defenseman Derek Forbert (No. 9). Instead, after the Tampa Bay Lightning chose Prince George forward Brett Connolly (No. 3) with the sixth pick, Carolina chose Kitchener's Jeff Skinner, a 50-goal scorer but ranked just 34 th among North American skaters by Central Scouting, at No. 7. Atlanta took Russian-born forward Alexander Burmistrov of the OHL's Barrie Colts at No. 8. Burmistrov, a highly skilled but small forward, was ranked No. 11. Finland's Mikael Granlund, Central Scouting's top-ranked European player, went to Minnesota at No. 9, but the New York Rangers pulled another surprise when they passed on higher-ranked blueliners Fowler and Gormley to choose Dylan McIlrath, a defenseman from Moose Jaw of the WHL. He finished the season ranked 17th by Central Scouting, up from 27th at midseason. Dallas took the No. 2-ranked goaltender with the 11th pick – but the choice of Jack Campbell was a surprise in its own right because the Stars acquired Kari Lehtonen from Atlanta late in the season and signed him to a three-year contract. Anaheim, which lost Scott Niedermayer to retirement this week, was delighted to see Fowler drop to them at No. 12. Phoenix, using a first-rounder obtained from Calgary, followed by taking Gormley.